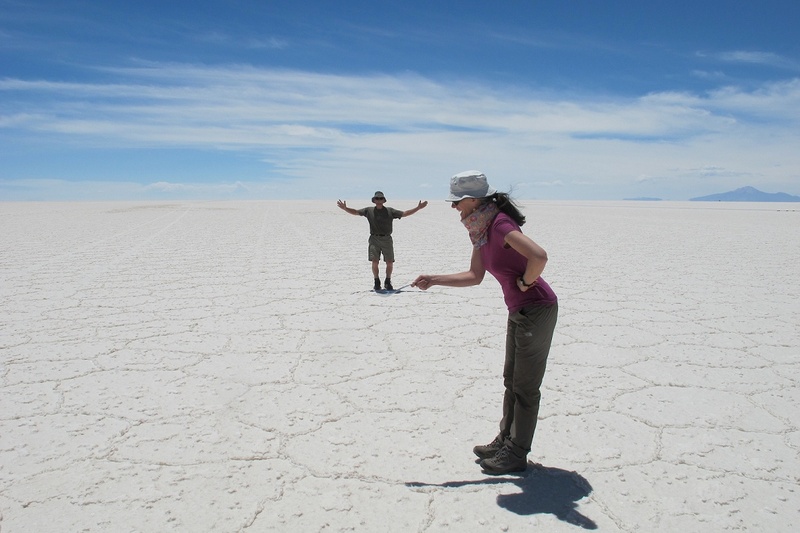 “What do you think about going to the Salt Flats when we’re in Bolivia,” I ask? 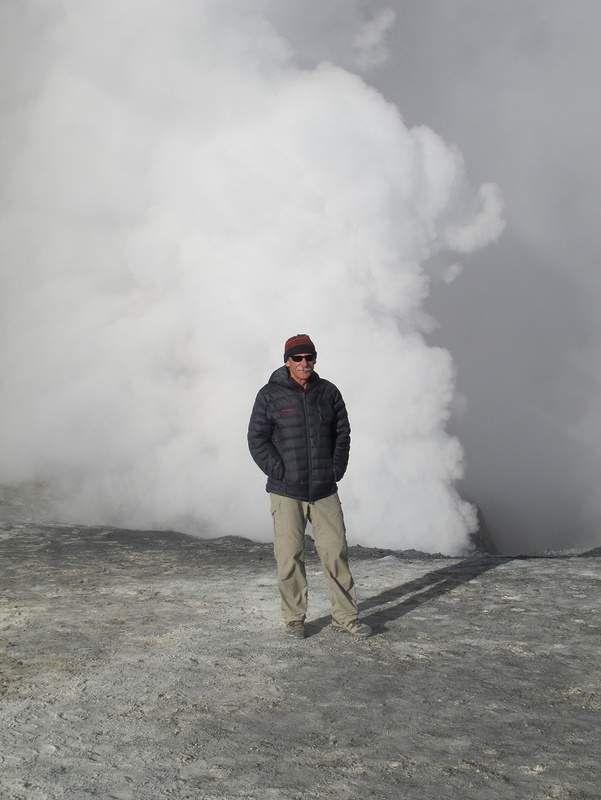 “I don’t know, there’s a lot to see,” says the CEO of Dugla Tours. “ Ya, I know, and it is at a pretty high elevation. Let’s think about it,” says I. 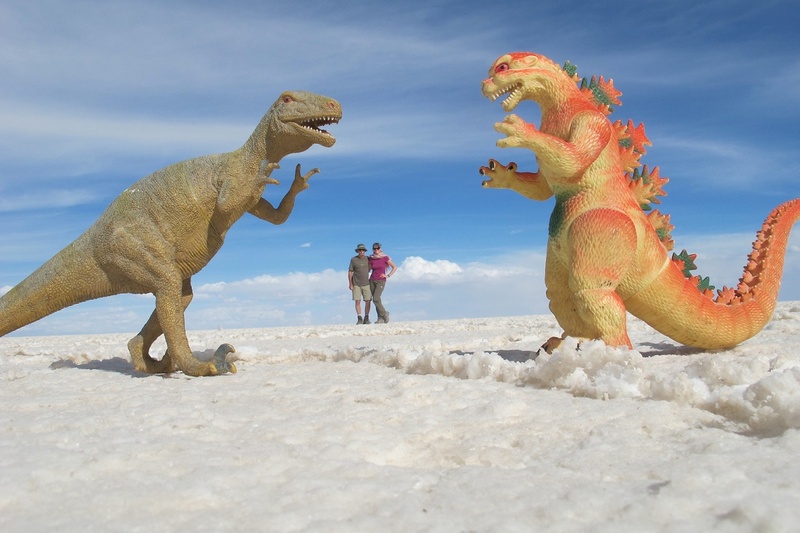 So, to think that we almost didn’t go to Bolivia’s gem, Salar de Uyuni, at about 10,000 square kilometers, the largest salt flats in the world, with mind-blowing scenery, is a bit of a shocker. And the great people we met? Well, let me tell you about it. 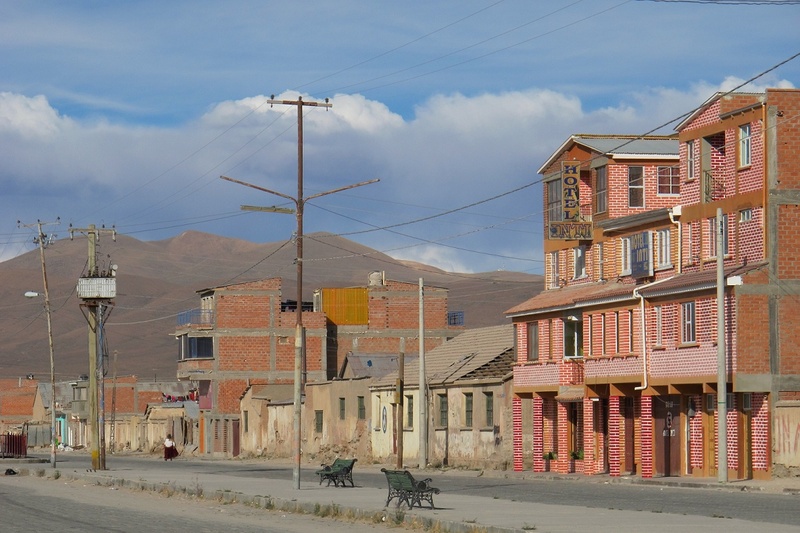 After we finished our volunteering with Up Close Bolivia at the end of November, we boarded a night bus (“aren’t we too old for overnight buses?” we’re thinking) in La Paz for Uyuni, the gateway town to Salar. The overnight busses in South America can be quite plush and we were on a very grand one, indeed. “Meal” service, movies, wide reclining seats, blankets and pillows, “wi fi” (this became a joke for us on our travels because “wi fi” is often offered, but unavailable) and a bathroom! Believe me, this is a big deal, some don’t have them and if they do, they are often locked. Turns out we really would need a bathroom on this ride! 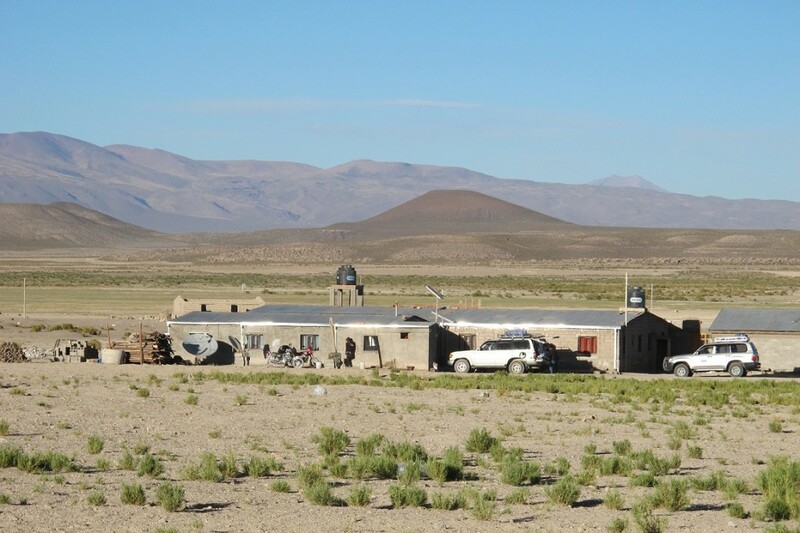 After our 12 hour ride, we arrive in downtown Uyuni, a wild-west town, if I have ever seen one- afterall, Butch Cassidy and the Sundance Kid were shot near here- dry as dust, with tumbleweeds rolling down the middle of dirt roads. I half expected to see Marshall Dillon and Miss Kitty stroll by! 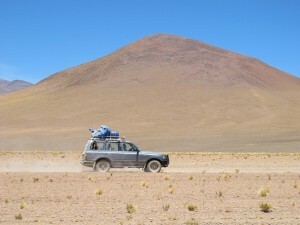 Dragging our suitcases up and down the dirt roads in the already intense sun trying to find our hotel, I feel a mother of an altitude headache coming on. Finally finding the “Tambo Aymara” I crawl into bed and Doug heads out in search of Sorochi pills, the Andean wonder drug (or, placebo, not that I really cared) made from a whack of caffeine and aspirin. 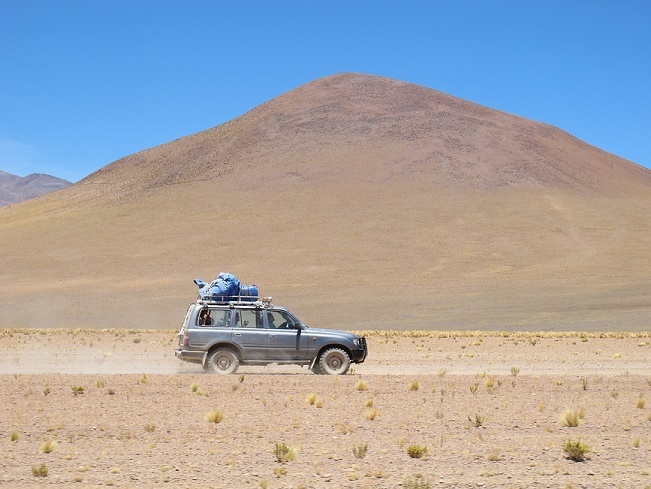 Twelve hours and a fistful of pills later, my head feeling better, I drag myself out of bed, ready to board one of about a hundred jeeps carrying tourists across the flats for two, three or four-day tours. 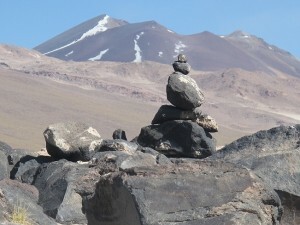 Our travel companions include one Austrian, three Belgians and one cranky Bolivian- our driver! 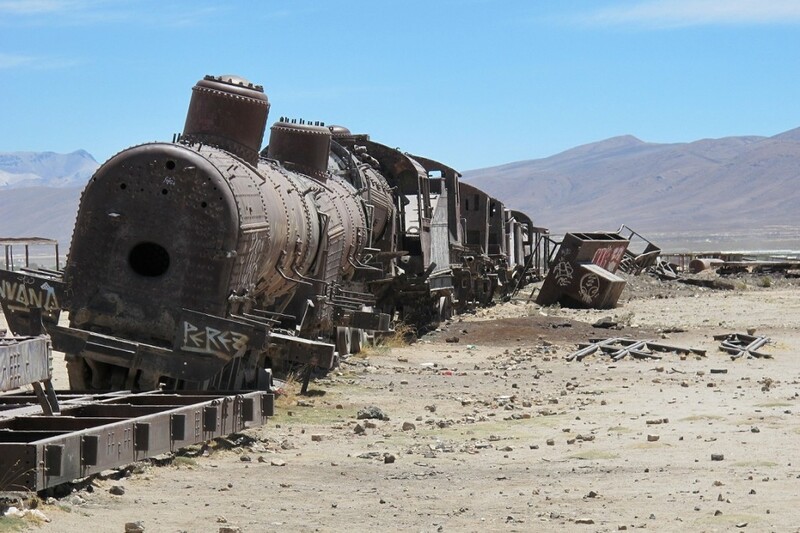 First stop on a tour of the Salar is always the train graveyard, just outside of town. 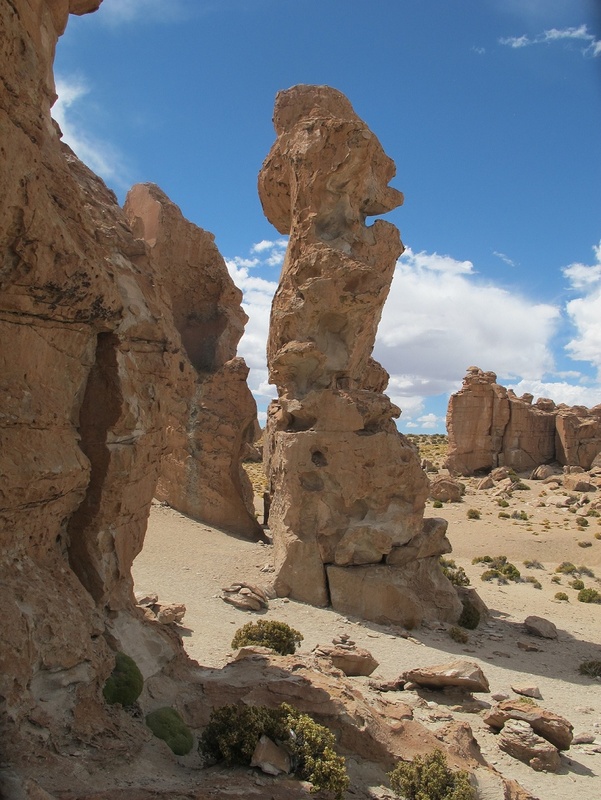 Uyuni was a major trading hub in the late nineteenth and early twentieth centuries, an intersection where trains from Potosi, Chile and Argentina would meet carrying minerals down to the sea. When the minerals were depleted in the early 1940’s, the British engineered and built trains were left to rust about 3 km out of town. After touring the ghost trains and trying to get a decent photo without a head or leg poking out between the rail cars, we set off for the sea of salt. 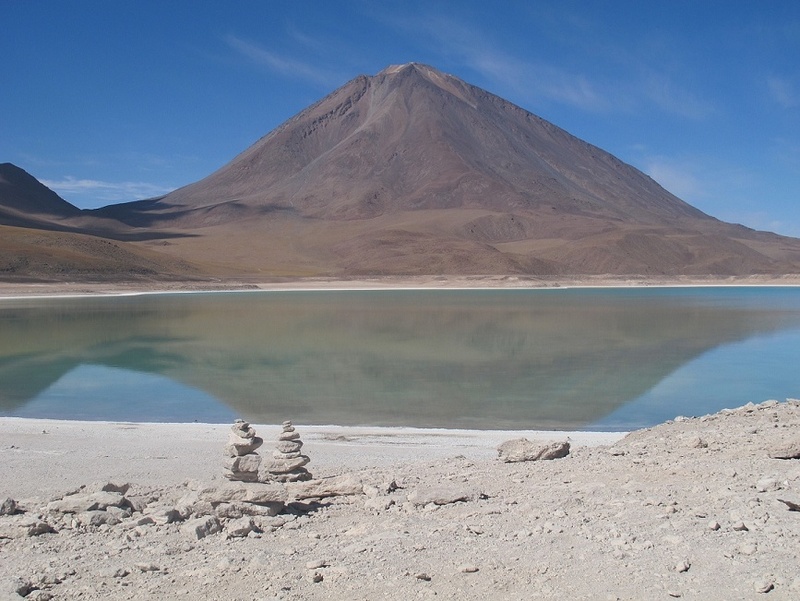 It is hard to describe the beauty of the Salar- a vast expanse of white as far as the eye can see under a deep blue sky- and being a Canadian, all this white kind of messes with your head! You think you are looking out at a frozen lake, but the temperature is about 30C and if you don’t cover up, you’ll burn to a crisp. Holy smokes, where are my sunglasses? Salar de Uyuni. 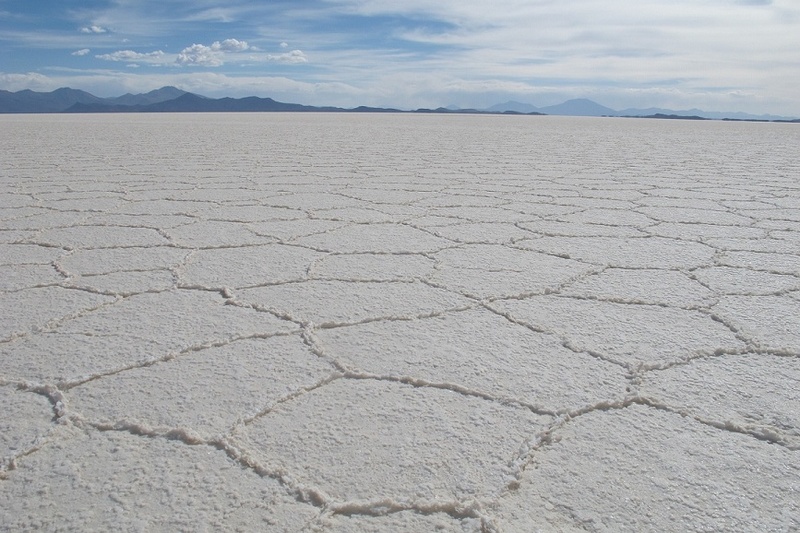 I’m sure one of our science-nerd friends can tell us about the pentagonal salt-crust patterns! 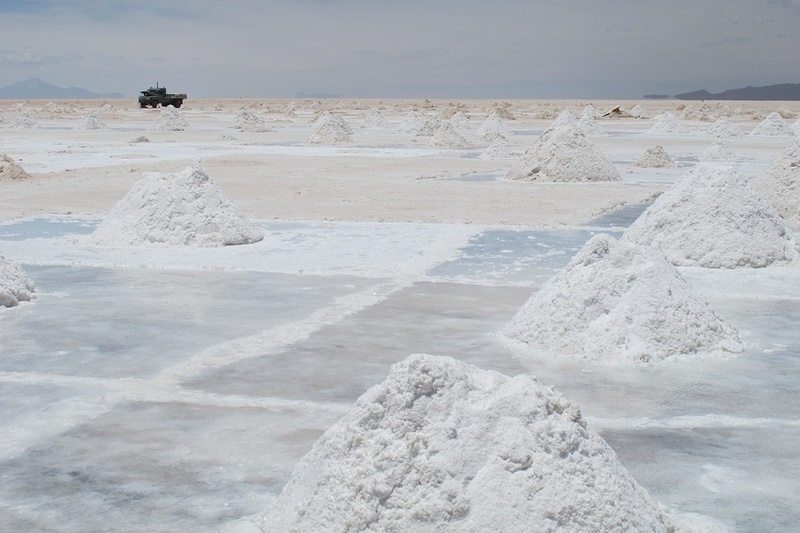 Collecting the salt for processing. 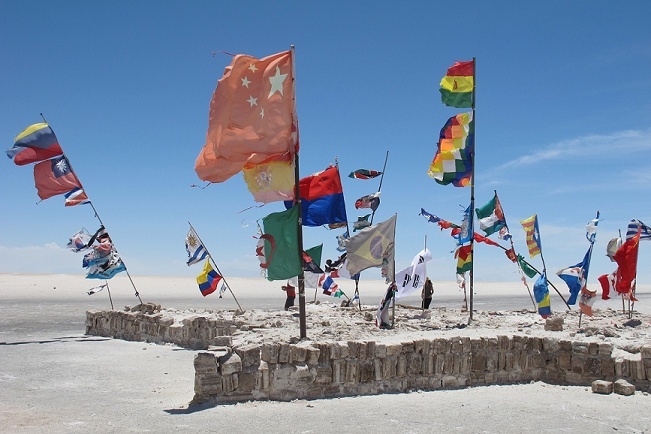 First, we stop at a monument of world flags. Who knew a gaggle of flags could look so cool? 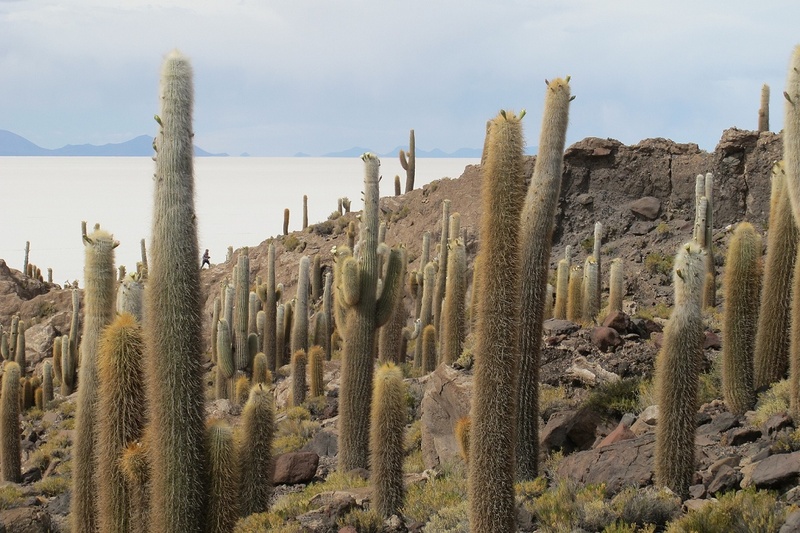 Next stop, the barren, but beautiful Isla del Pescado, home to 1000 year old giant cacti. 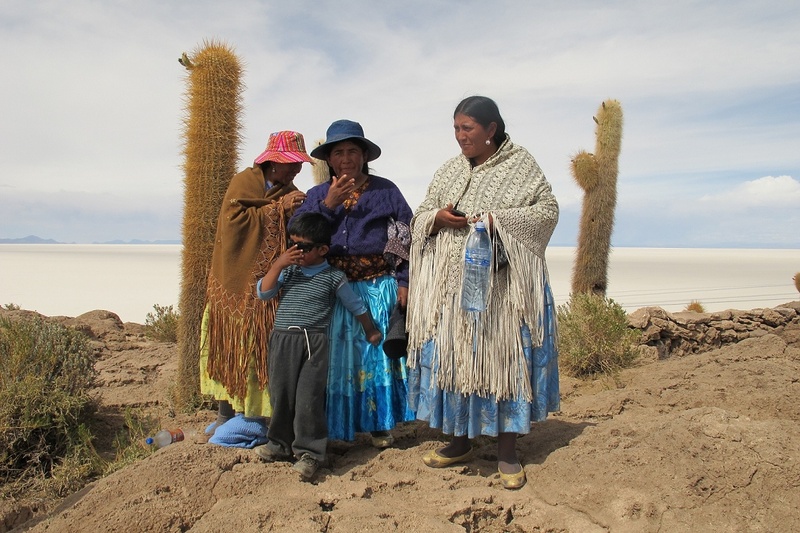 So great to see beautifully-dressed Cholitas as we walked to the top of the island. Have I mentioned I have a bit of a Cholita-obsession? More on that later in another post! 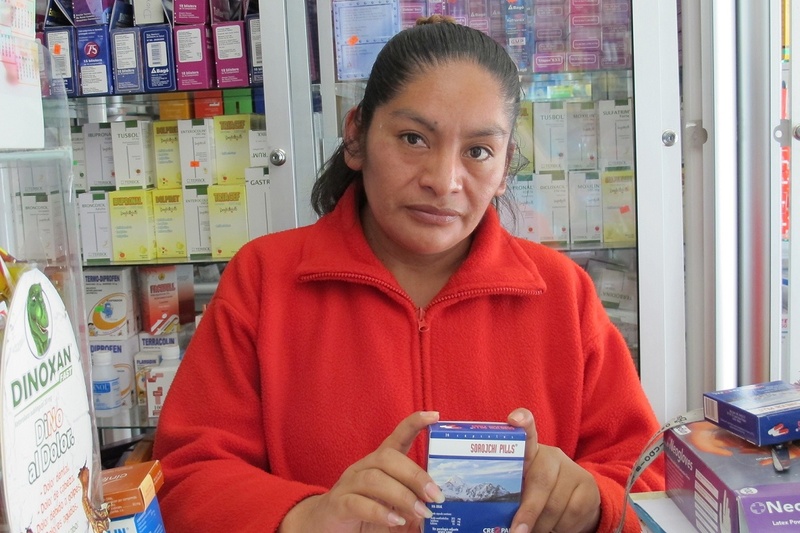 Notoriously shy Cholitas who graciously allowed me to take a photo! 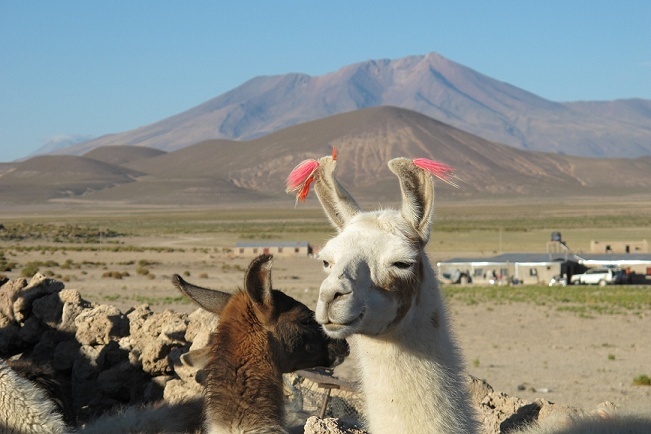 On a Salar tour, expect to see unbelievable scenery, but I’m telling you now- don’t go for the food! That is, unless you happen to be sharing your tour with a Michelen Star chef! 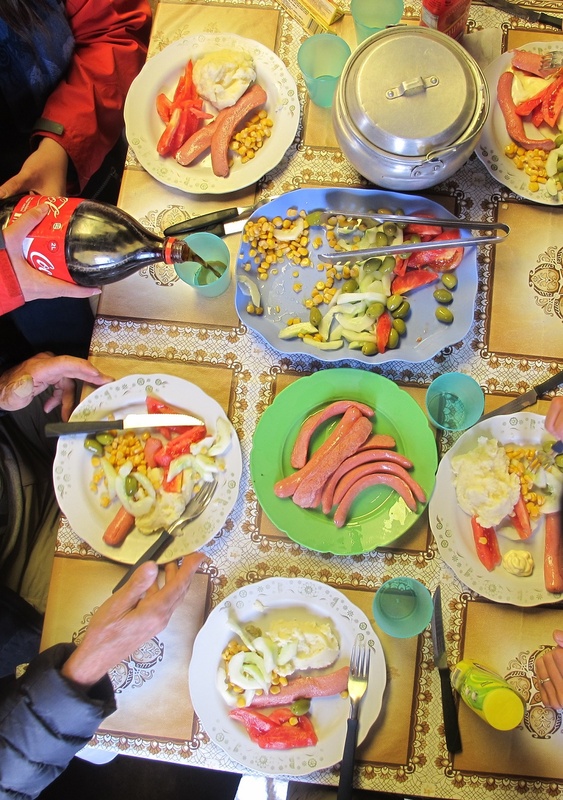 As we were digging into our shore lunch on Fish Island- yes, it really has a shore, since the Salar was once an ocean- of cold, dry, fried alpaca steak, a few veg, cold rice and Coke- it just happens to slip that Willem and his wife Shanna run an exclusive restaurant in Belgium. So, even if the food was beyond bad, we had three days of delicious conversations about food, swapping stories and recipes, as we roared along in our jeep. Shore lunch at Fish Island. Top marks for presentation, at least! 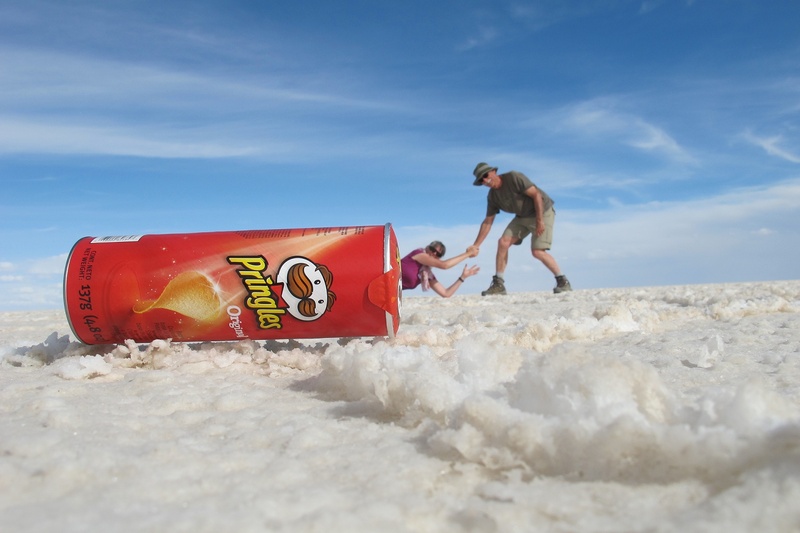 Come on, let me eat the Pringles!! 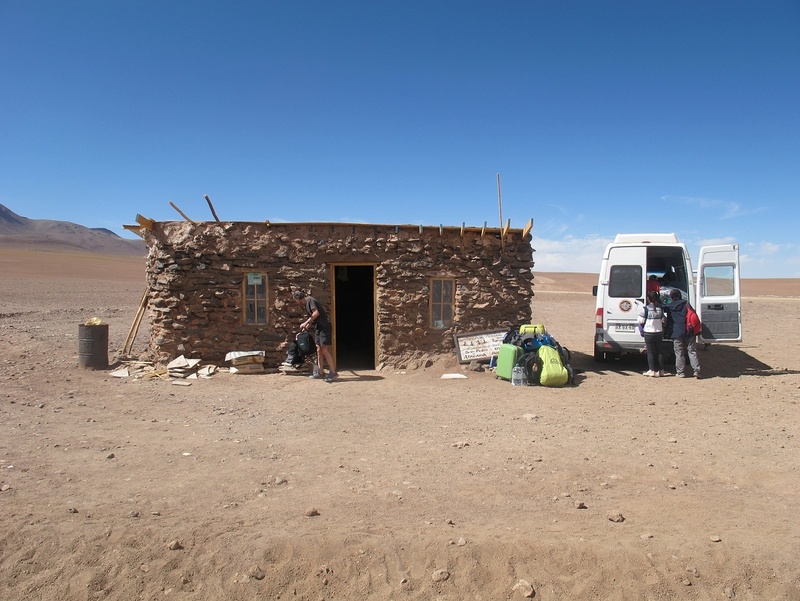 And, every tour also includes a night at a salt “hotel.” As we drive along late in the day, I am imagining something grand like the ice hotels in Sweden, when we pull up to what looks like a low-lying shack. But, you walk through the door into a room lined with salt tables and stools filled with a multi-national crowd all drinking beer, to Doug’s joy. And, if you are willing to suspend disbelief just a tad, it actually is kind of cool. 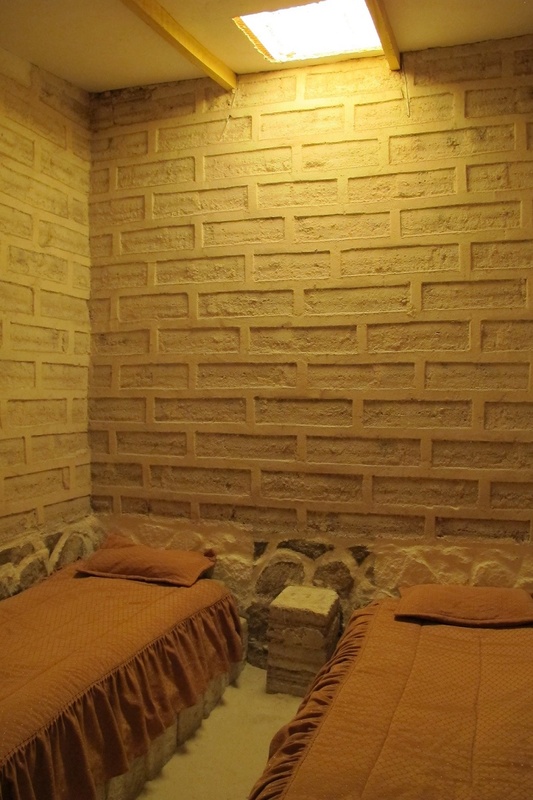 Sleeping in a room made of salt bricks, on a salt bed, on a floor of salt. Who does that? 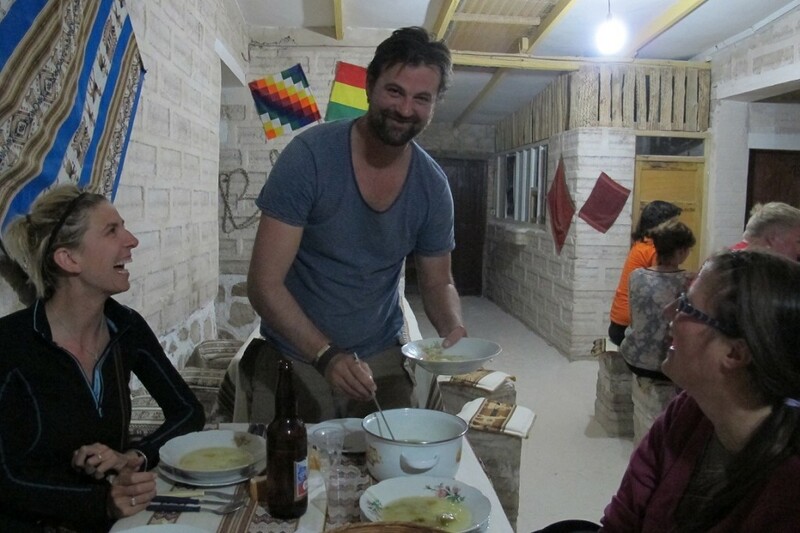 A most-mediocre Caldo de Gallina at the Salt “Hotel” served by Chef Willem! 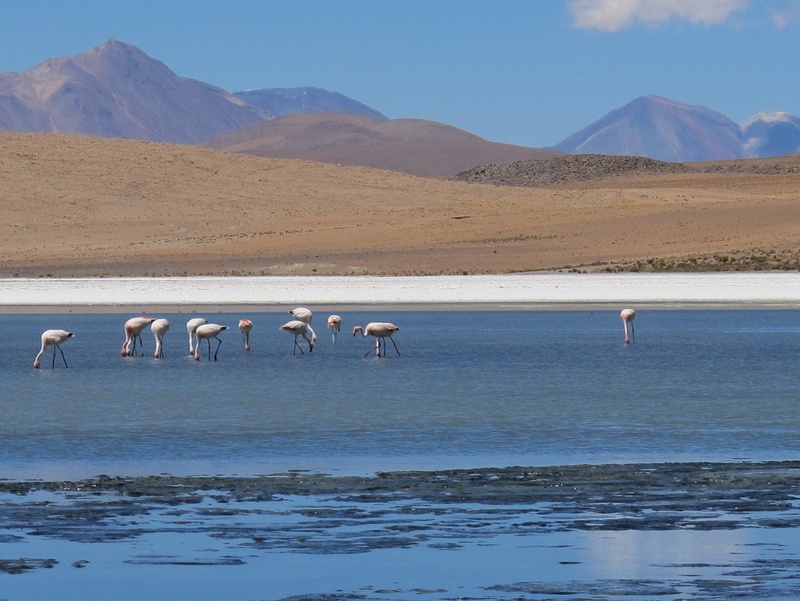 What I didn’t really realize about our trip to the Salar was that it also included two days of travel through some of the most amazing and unusual scenery ever. 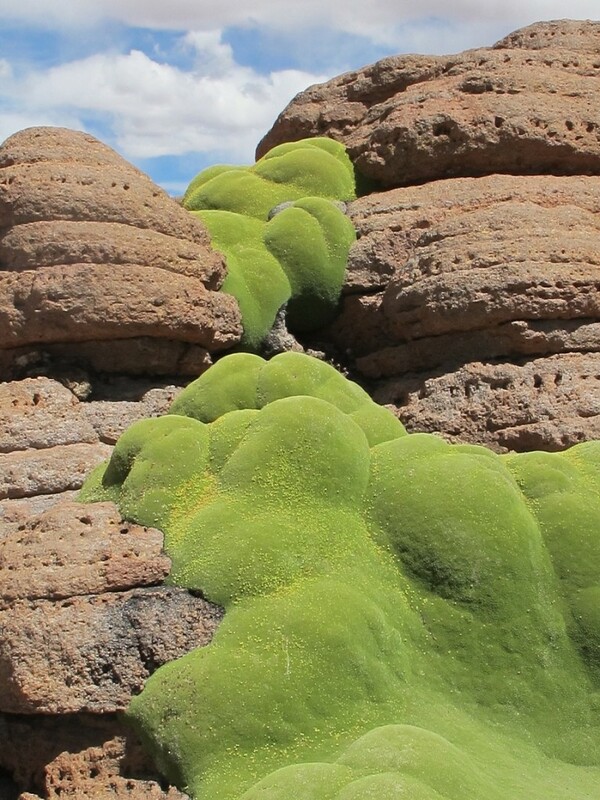 Mountains of red, purple and blue, lakes of green, yellow and orange, flamingos in every shade of pink, bubbling geysers and hot pools, and a moss-like plant that seemed to pour over massive rock formations like liquid green velvet. 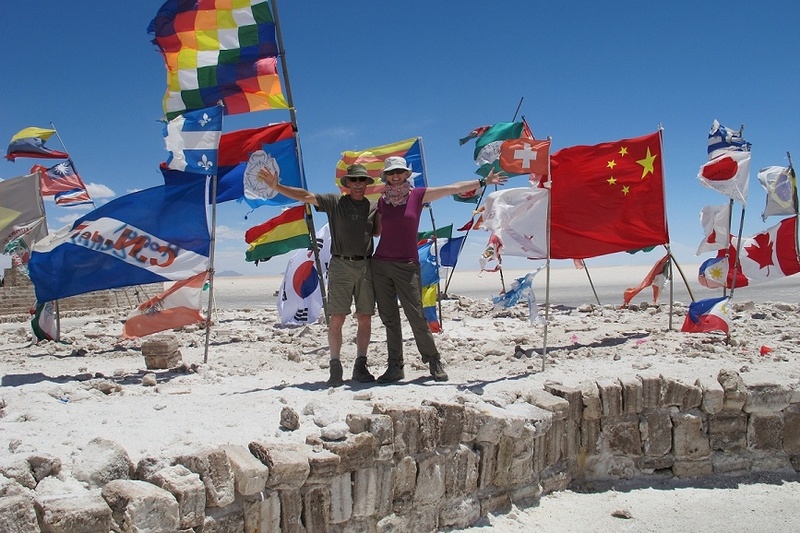 One of the highlights of the trip, aside from our great travel companions and the scenery, was dropping off Eva, our Austrian travel-mate who was carrying on south, at the Chilean border. We were sad for her to go, but what a kick seeing the border shack! You want to talk wild frontier? There appeared to be only a ditch marking the border, with a couple of tourist vans on either side. I was tempted to jump the ditch, just to say I had been in Chile! Donde esta la frontera, por favor? 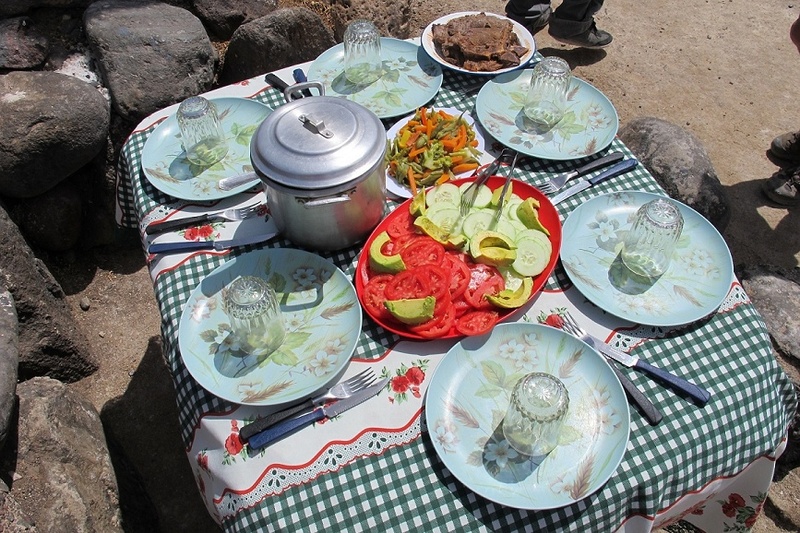 And, just to remind us that you don’t go on a Salar tour for the food, we stopped for our last lunch of the trip. To be honest, the boiled wieners weren’t bad! Boiled weiners? Don’t mind if I do! 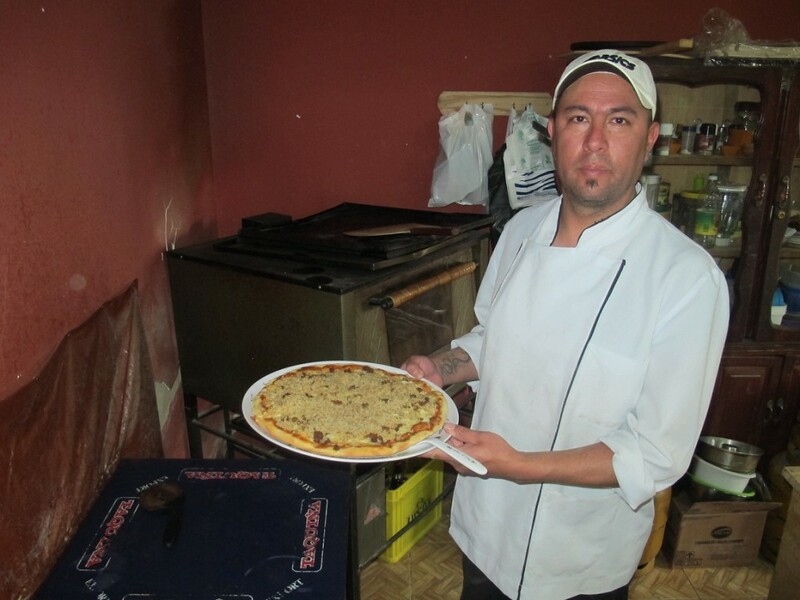 Prize-winning, quinoa-crusted, alpaca-topped, super yummy pizza! Gracias Fernando! Oh, Al! I love this! Can hear your voice and see your smile! Keep the posts coming… Just added one more to my ‘must read’ blog list!!! Travel safely, you two! I just read your entire blog!! Well done Al! 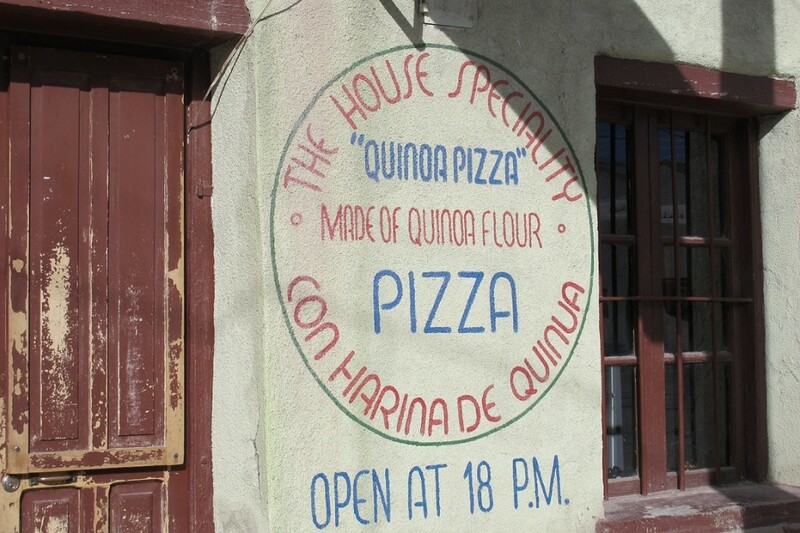 I’ll be back in Invermere in the springtime and I’ll be over for some quinoa crust, alpaca pizza. I’m sure you two will have the recipe perfected by then!! 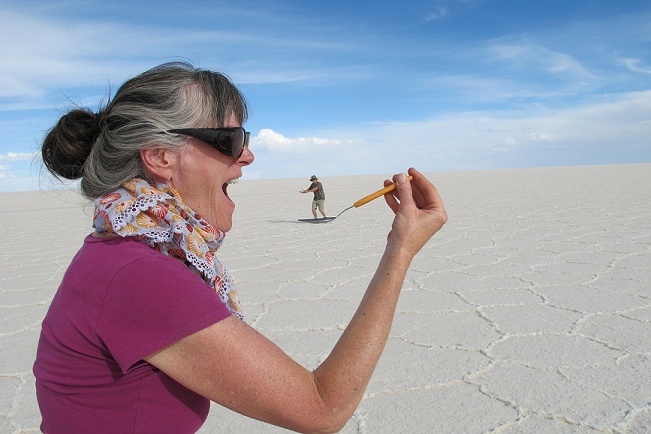 Thanks for the colourful and entertaining post from Bolivian salt land! Love it, and it brings back fond memories of our own trek across the crusty flats. Keep your gazettes of geezers and geysers coming! Fantastic photos and even better stories that keep us smiling. 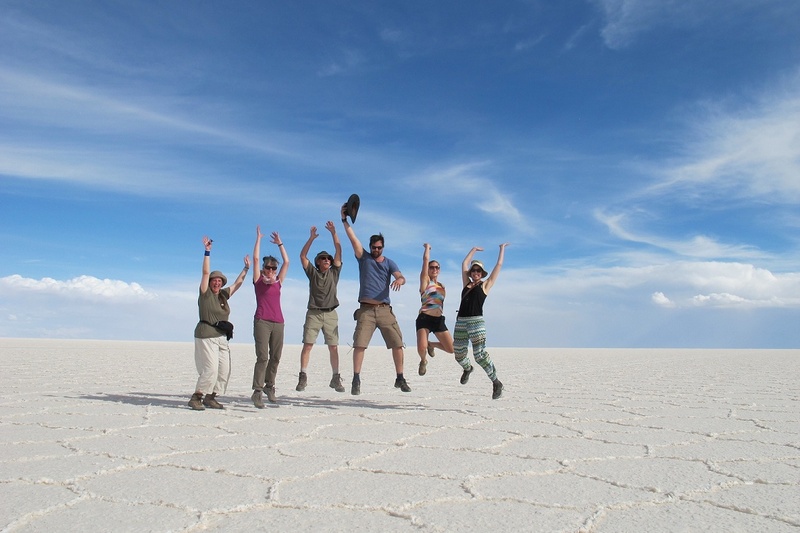 Thanks for sharing the ongoing adventures of Dugla Tours! Love it.